WASHINGTON, D.C. -- The substantial majority of Americans still disapprove of the job Congress is doing, while just 17% approve. This is up slightly from the 13% approval rating Congress received in March. 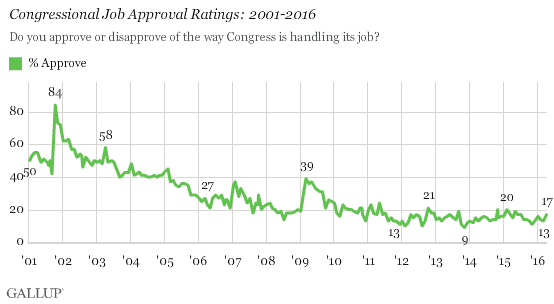 Congress' approval rating has not exceeded 20% since October 2012. These data, collected April 6-10, come three months into Paul Ryan's tenure as House speaker, and as 34 Senate seats and all 435 House of Representatives seats are up for grabs in November's elections. In addition to the question of which party will control each chamber next year, two sitting U.S. senators -- Sens. Bernie Sanders and Ted Cruz -- are running for president. Amid the backdrop of the presidential and congressional elections, Congress is grappling with a variety of issues, ranging from a Supreme Court nomination in the Senate to debt management in Puerto Rico. Congressional action has seemingly been more muted and less controversial in 2016, given the deal struck late last year by outgoing Speaker John Boehner that passed a budget and debt ceiling package, allowing incoming Speaker Ryan to avoid a high-stakes partisan battle. Congress may also be hesitant to vote on controversial measures during an election year. Regardless, its approval rating has not moved appreciably since the deal was struck. Although Republicans control both the House and Senate, Democrats nationwide (20%) remain more approving than Republicans (12%) of the job Congress is doing. Congressional Republicans are still dealing with the fallout of a showdown between newer, more conservative Republicans who eschew compromise, versus more moderate, establishment party members who are willing to make deals with Democrats to pass legislation. This divide may still be dampening rank-and-file Republicans' approval of Congress. Meanwhile, 17% of independents approve of the job Congress is doing. Congress has long been the least popular of the three federal government branches, but the consistency of its low ratings over the past 6 ½ years has been remarkable. The current rating is not much higher than the institution's all-time low approval rating of 9% and is far below the all-time high rating of 84%, measured shortly after the 9/11 terrorist attacks. With approval ratings as low as they have been for several years, it is unlikely that they will change markedly in the coming months, as congressional gridlock complicates any efforts to enact major legislation -- especially during an election year. 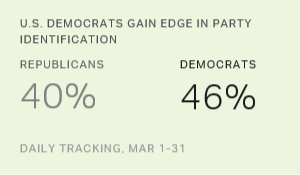 Americans' party preferences now tilt decidedly toward the Democratic Party, with 46% identifying as Democrats or leaning Democratic and 40% identifying as Republican or leaning Republican. In October, the parties were tied. Fifty-two percent of Americans favor and 29% oppose Senate confirmation of U.S. Supreme Court nominee Merrick Garland. 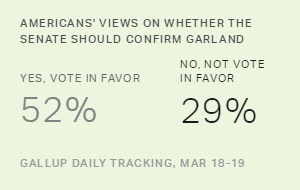 Support for Garland is similar to the 51% average for high court nominees since 1991.